Star government witness Rick Gates ended three days of testimony on Aug. 8 after admitting he lied, stole money, and cheated on his wife, as lawyers for Paul Manafort attacked his character. Manafort lawyer Kevin Downing got in a final shot in the federal court in Alexandria, Virginia, raising the possibility Gates had four extramarital affairs and then asking if he had a “secret life” from 2010 to 2014. Downing had completed the bulk of his cross-examination on Aug. 7, firing questions at Gates for several hours as he sought to portray him as an inveterate liar and thief to undermine his credibility with the jury. Manafort has pleaded not guilty to 18 counts of bank fraud, tax fraud, and failing to disclose foreign bank accounts. According to trial testimony, he used the accounts to receive millions of dollars in payments from Ukrainian oligarchs. Manafort briefly served as the campaign manager for then-candidate Donald Trump in 2016. He was indicted by special counsel Robert Mueller, but the charges are unrelated to the campaign. Gates was the deputy chairman of the campaign alongside Manafort. He pleaded guilty to charges unrelated to the campaign in February, and is cooperating with Mueller’s team for the possibility of a reduced sentence. 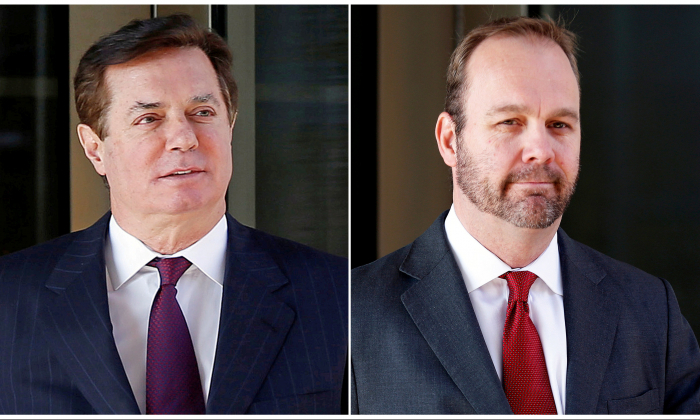 Gates testified at length about how he and Manafort doctored and backdated financial documents, hid foreign income, and falsified tax returns. He said he engaged in the wrongdoing at Manafort’s direction. He also admitted to leading a “secret life,” embezzling funds from Manafort, and getting involved in other shady dealings. Manafort’s defense team has tried to pin much of the blame for the financial crimes on him. After the cross-examination concluded, prosecutor Greg Andres asked Gates whether the special counsel’s office had tried to coach him on how to testify.